He said the lights in his porch kept going dim with any small load connected to an outlet. Took it apart and someone used 300 OHM antenna Twin Lead to wire it. I know. We've all heard the stories and/or seen the shoddy and even scary work done. I hate to sound/read like a nitpicker with safety precautions. It is just so simple... and even very cheap... to do things right. E-e-e-e-y-o-w. How dumb. Shoulda used coax. Before someone sends a PM about how dangerous that is, it is ironic humor. He shoulda used lamp cord. My parent's cat used to eat my headphones. Turns out that head phone wire looks almost the same as electrical wire in things. If I can find those headphones, maybe I could send you the wire so you could rewire the box? Anyone see old phone lines as a cloth covered twisted pair of 20ga wire. I one saw an outlet ran on that. There was an electrician in the 50s in my hometown who used a bare ground wire as a traveller in a three way switch circuit. I have found his handiwork in at least two houses I have worked in. Both times it was by touching a "grounded" metal junction box in an attic. The last house fire I saw involved a junction in the attic with no enclosure. Soldiered junction with friction tape on underrated wiring. Insulation blown into attic trapped heat. The Electric Code is an outgrowth of the NFPA and insurance industry. I highly encourage anyone with an older house to have the wiring checked out by a reputable company. Have them look at current loads, wiring conditions and even use thermal imaging. You can never be too safe. That takes me back. I used to see the occasional [bare] wire and tube.... but (back -in-the-day) I saw lots of the soldered wires with sticky, messy, friction tape. Believe it or not... my own wiring experience does NOT pre-date wire nuts. Now... I almost feel young. As a non-electrician, why would wires be soldered together in the box? Seems to me the only reason to do that is if the bundle is so large that a wire nut wouldn't be capable of locking them all in. Seems to me that if there were that many wires entering a single box, it would be better to have a sub panel of some kind with a set screw type lock down for each so they could be worked on. When you solder them all together, that would be a nightmare for rewiring. True story: When I went to replace my attic fan (motor finally burned out - it had been installed sometime in the 50 years before we bought the house), I found that it had been powered by tapping into the lighting circuit in the hallway (not really an issue for me), running a line to the fan's thermostat box, and then adding a switch leg from there down into the hall closet - so it could be shut off if desired. However, I found that whoever had installed it left the HOT lead live, and switched the NEUTRAL line. Confused the heck out of me when I first opened it up. I ended up rewiring the whole thing. I fixed that problem when I was replacing the motor. Switched neutral? Never seen that before! Neighbor asked me to come over and see why a breaker kept tripping in his house. Traced out circuit, could not find anything that was shorted although there was a direct short to ground somewhere. Thought it might be a staple inside wall. He had a home warranty policy so called them and a licensed electrician comes out. He said he did something in his breaker panel to fix it - so I was very curious what he did as I had looked in there already and saw nothing obvious (had replaced breaker previously). 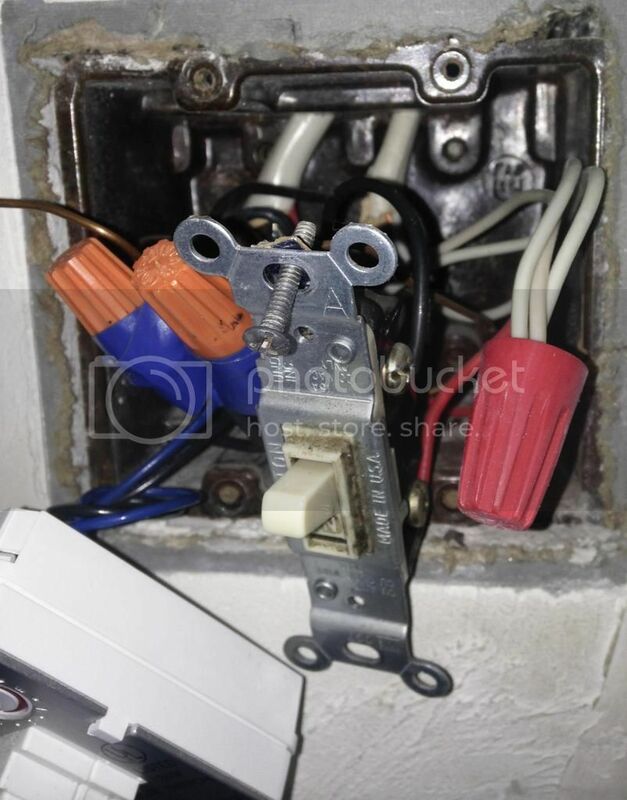 The electrician determined the hot (black) wire was tied to ground somewhere, so HE REVERSED the black and white wires for that circuit - black to the neutral bar and white to the breaker but did nothing else This reversed the polarity on the whole circuit - including about 6 outlets in his house including the garage! I could not believe his "fix" and told my neighbor this was a huge safety issue. So I returned the wiring to the right polarity in the breaker panel and set out to find the issue. I opened every electrical box in the circuit tracing the short location by disconnecting in / out leads to outlets and switch boxes. Eventually found it was a buried run going from his garage to a post light in his front yard that was on that circuit. I'd tar and feather that electrician, then run him out of town on a rail. When wiring was first introduced... the desired method was "wire and tube" (porcelain/ceramic tubes inserted in holes drilled in rafters and floor joists, with bare wire run through the tube) with the runs or leads from that being tar-paper and cloth-wrapped wires. The leads (wire runs) were soldered to the bare wire and taped over with a old sticky cloth/tar-like tape called "friction tape". I always called it "Knob and Tube" due to the knobs that suspended that stuff. As a non-electrician, why would wires be soldered together in the box? I think this was pretty common in the "old timey days" pre plastic wire nuts. The house I grew up in, built in 1940, the wires weren't even soldered, just tight twisted with pliers and wrapped with cloth tape. Soldering would have at least added another level of mechanical safety.